Every Saturday growing up, my parent’s house would be filled with music (either show tunes like Les Miserables or classic rock like Van Morrison) and they would would make either pancakes, waffles or french toast. Dad would heat up the syrup and we’d all sit down to breakfast together. I have fond memories of those mornings and sometimes if I happen to find myself out and about on a Saturday morning, I’ll make my way over to my parent’s house to say hi and grab a pancake or two. Making pancakes has always been hit or miss with me – usually a miss (don’t ask how someone can mess up pancakes) and I’ve never attempted French Toast [until this past Saturday] on my own, so I never thought of continuing the tradition at my own house. While sifting through Pinterest, I began to notice that I ‘liked’ a lot of cute breakfasty things that I thought might be nice to make for Mike some day. One of them that kept cropping up was a bacon/egg dish that was made in a muffin pan. 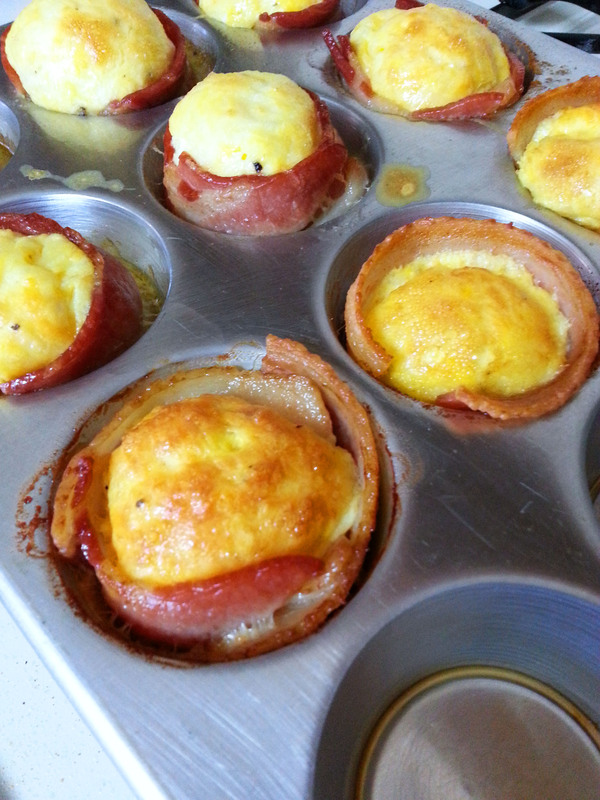 It looked easy enough, so one Saturday morning while Mike was still sleeping I crept out of bed, lined the sides of the muffin pan with bacon, whipped up the egg/cheese mixture, poured it inside each little bacon ring and popped it in the oven for 30 minutes. The best part was that it only took a couple minutes to prepare and I could now go back to bed for a half hour. The plan was for Mike to wake up to the wafting smell of breakfast – but he actually woke up when I came back to bed. I told him to go to sleep for 30 more minutes and then to wake up with it smelled good. It sure did smell good – and tasted good too. We ate all 9 little bacon/egg cups and enjoyed some pineapple spears along with them. And from that Saturday morning on, instead of just spending time together over cereal, I make a hot breakfast of some sort (omelets, pancakes – when they turn out, lots of bacon, and hopefully when my new breakfast cook book comes in the mail, plenty of more fun things). I really like living in my house – or else we probably wouldn’t have purchased it – but there’s a window of time that I REALLY REALLY like living here. It’s when the weather gets nice enough to turn off the heat, but before it gets oppressively hot and the air conditioner is required. We throw open most of the windows and the house takes on this crisp, natural, outdoors smell and has a very slight humidity about it. The temperature in the mornings is in the low 70s, so it’s pleasantly warm. The East sun is streaming in (this is why I was an advocate for us abandoning taking the West-facing master bedroom for ourselves and instead taking the smaller (East-facing) office for our bedroom). It’s too warm for the blankets, but there’s just enough of a breeze to warrant keeping the sheet on the bed. I absolutely love laying in bed when these conditions are what surrounds me – and even getting ready for work in the morning is a more positive experience when everything is so peaceful, bright and warm.